Campaigning MEP Julie Girling is leading a move in the European Parliament tomorrow (Tuesday 16 January) to ban so-called pulse fishing. 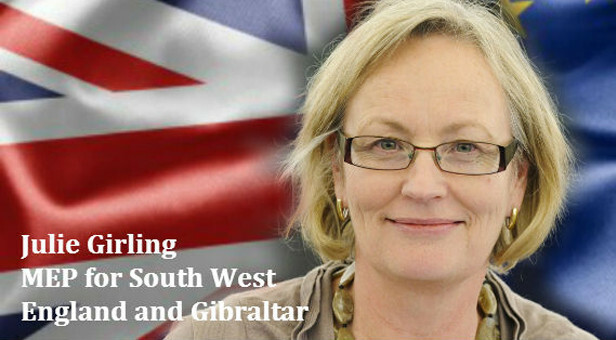 Mrs Girling, MEP for the South West and Gibraltar has linked with colleagues in the European Parliament’s Green, Liberal, Left and Socialist groups to press for an end to the destructive practice of pulse fishing, which kills fish and other marine life indiscriminately with a powerful electric shock – a method that is blamed for creating deserts on the sea bed wherever it is used. The issue will be voted upon in Strasbourg tomorrow as part of a package of measures governing technical measures for European fisheries. Mrs Girling and her colleagues want to end a legal loophole which for a decade has allowed pulse fishing in limited areas for “scientific purposes”. In practice, they say the technique is used mainly by the Dutch fishing fleet to land large and lucrative hauls of flat fish such as sole, plaice and turbot while laying waste to stretches of the continental shelf. The EU first banned electric fishing in 1998 along with other destructive techniques such as use of explosives and poison. However in 2006 The Netherlands sought and was granted a derogation to allow pulse fishing for scientific research and that still continues. Mrs Girling said the Dutch have been widely condemned for using the derogation as a legal cover for commercial pulse fishing in the same way that Japan has claimed scientific justification for whaling. She explained that fishing crews drive electric terminals into the seabed before firing a powerful electric charge between the two. The pulse kills not only the adult flatfish on the sea bed but also most fry, worms, shellfish and crustaceans, sometimes for hundreds of yards around. The technique, she says, is banned outright by China, the United States, Japan, Russia and other major players in global fishing. Mrs Girling added, “As a fishing technique is very efficient and cheap – but it leaves nothing behind. “The effect is devastating. British fishing crews in the South East say that in some places they cross out of the British 12-mile protected zone and then find nothing there. “Marine life has all but disappeared because of pulse fishing, not just the marketable fish but all the smaller ones and all the bait species such as lugworms.